The Last Leaf Gardener: Happy 1/2 Year! Well, dear reader, today is June the 30th 2012, which means that tonight is New Year's Eve for the half year! Six months down, and six months to go! And, as I promised in this past Monday's post, I am posting on a non-scheduled day in honor of the half-year. As you may recall, last year at this time I wrote a three part post in honor of the half year, where part one was looking back at January and February, part two was looking back at March and April and part three was looking back at May and June. 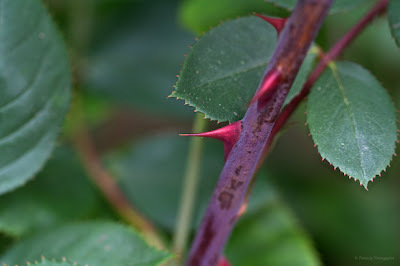 The thorns felt they were often given bad press; and they brought up another quote: "Life is thickly sown with thorns, and I know no other remedy than to pass quickly through them. The longer we dwell on our misfortunes, the greater is their power to harm us," (from the writer/philosopher, Voltaire). The thorns admitted that it's hard to disagree with Voltaire's premise, but like me, they feel that this "type" of quote can be interpreted as dismissive, especially when one is going through angst in their life. While it is necessary to move on when one encounters rough times, it is also necessary for one to know he/she is not alone. As for my vision loss, one of my eyes turns in, causing remarks such as, "you look like a dog going blind," to be directed at me. That being said, there are many folks out there who suffer much more than yours truly from their individual medical afflictions, and one advantage of being born with afflictions is that it usually causes one to be more empathetic to folks who are marginalized for whatever the reason. At least this has been a "motivator" in how I interact with others, especially in my volunteer work with the elderly, and it has been the impetus for my mission in my indiegogo Campaign, which I launched last week — a campaign whose slogan is "The very old, they are miracles like the just born; close to the end is precious like close to the beginning." To help raise awareness, about the truths implied in this quote, I will be giving voice to the things I grow in my garden as they share their life experiences via an imaginative combination of animation, music, voiceover, and photography, as well as charming story-lines. That's it for today, dear reader, and I will be resuming a Monday and Friday Blogger posting schedule AFTER the 4th of July. (You can always catch me on my tumblr Pages, Facebook, Pinterest on the other days).